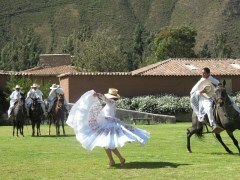 On arrival at Cusco airport your guide will meet and accompany you on the 90 minute transfer to the your Sacred Valley hotel. We recommend your flight arrives by 10am. You are sure to want to stop along the way for photos at the many fantastic viewpoints. After checking into your hotel you will enjoy a nice lunch. A visit to a local potter rounds off the day. You will have the chance to craft your own special souvenir under the watchful eye of master craftsmen. Finally your guide will take you back to your hotel where you can rest for the night and enjoy the peace and quiet of this beautiful rural area. 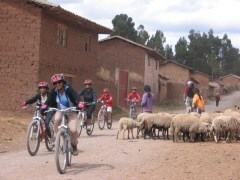 Today you cycle out of your door and follow a beautiful dirt road alongside the River Urubamba. Travelling slowly is the perfect way to appreciate the beauty of this traditional agricultural area. Vibrant fields of corn, kiwicha and quinoa line your route as cheery farm workers put down their tools to wave as you pass. After a few hours you cross the river and enter the small town of Pisac and enjoy a well earned lunch. Today is market day in Pisac. Most of the crowds will have left by now so you can wander amongst the many artisan stalls at your leisure. If you look carefully you may also see some of the elder locals, who have come down from remote hill villages to barter potatoes, carrots and onions in exchange for tropical fruits brought up from the jungle. A short drive takes you back to your hotel to relax. A day of variety awaits you today. A 40 minute drive takes you to the shores of Lake Piuray. Set amongst fields of corn with fantastic views across to the snow capped Urubamba mountains, this really is a special place. You will help prepare a Pachamanca, a very traditional Peruvian meal where meat and vegetables are cooked on hot stones in a hole in the ground. 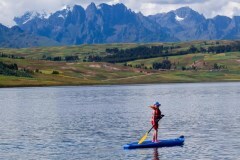 Once the food is cooking, you can enjoy some fun on the water with the world’s highest fleet of stand up paddleboards. This fantastic new sport is spreading fast across the world and you will struggle to find a better backdrop to take your first steps. Under the careful instruction of your expert guides, you will soon pick up the skills needed to head out across the lake. Once off the water, it is time to uncover your earthen oven and enjoy the succulent food you prepared. Finally you drive 15 minutes to the spectacular Salt pans of Maras. Worked by hand for generations these are a photographers dream. You then hike an old mule track, used to carry salt down to the valley. Today is the day you reach Machu Picchu. Built over 500 years ago this is one of new seven wonders of the world. And rightly so. Words do not do it justice. You take an early train to start your hike along the Inca Trail. A few hours climbing brings you to the beautiful Inca terraces of Wiñay Wayna where you enjoy a box lunch lovingly prepared for you by Alex our cook. A further gentle two hours, a final set of steps, you pass through the old Incan gateway, turn to your left and there it is. 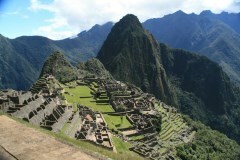 Machu Picchu unfolds before your eyes. Tonight you spend the night in the town below, perhaps enjoy the medicinal waters of the hot springs, but above all dream about tomorrow and your chance to explore fully the ruins of Machu Picchu. A 20 minute bus ride brings you back to Machu Picchu. Arriving before the crowds your guide will show you around and explain just how the Incas managed to build with such precision and such beauty, on such a remote hilltop. From altars used for human sacrifices, temples carved in the shape of condors through to stones used to tie the sun, this is a history lesson everyone will enjoy. If you are really lucky you may even see Paddington Bear. After a fantastic day, in a fantastic place, you board the train to sit back, relax and enjoy the scenery on your journey to Cusco. A leisurely day today. 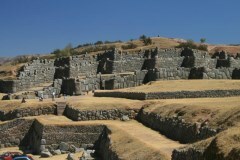 A 15 minute drive to the old Inca fortress of Sacsayhuaman. Standing guard above Cusco, the huge ramparts boast stones up to 28 feet high weighing 140 tonnes. Quite how the Incas moved them into place remains one of the world’s great mysteries. 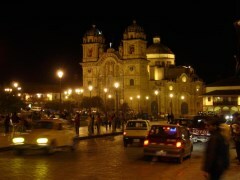 You will then climb to the top of the ramparts and enjoy a spectacular view of Cusco. Time to work off all that chocolate. A 40 minute drive takes you to the Pinipampa section of river where you can ride the rapids in your very own inflatable canoe. 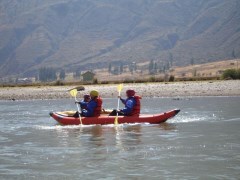 The safe but fun rapids are perfect for beginners and your expert guides will show you all you need to know. Whatever your age, you are sure to get off the water grinning from ear to ear. A tasty lunch at a local restaurant then it’s time to meet the locals. The four legged variety. At Awana Kancha you can feed the llamas and alpacas as well as seeing how the traditional cloth is woven and dyed. Then across the road at Ccochahuasi animal sanctuary you will see first hand just how big a Condor’s wingspan is as it swoops low over your head. Home to a variety of rescued animals, this is the ideal place to see native Peruvian animals such as condors, pumas, macaws and the Peruvian hairless dog. Today you are free to wander around Cusco, explore the cobbled side streets of the San Blas artist district or stare in awe at the Inca treasures in the many museums. This afternoon we will take you to the airport for your onward journey, perhaps to Lake Titicaca, the Amazon jungle, or even just home.